You don’t need a huge backyard to create a remarkable outdoor living room. Everything is packed into this intimate space. The ceiling used T1-11 decking and exposed, rough-cut pine rafters finished with a dark stain. The columns are brick that matches the home. The kitchen is finished in a random-shaped veneer stone with a large tile backsplash behind the FireMagic grill. The curved, raised bar top is finished in tile and provides great space for dining and entertaining. The floor is a stamped concrete overlay in a flagstone pattern. 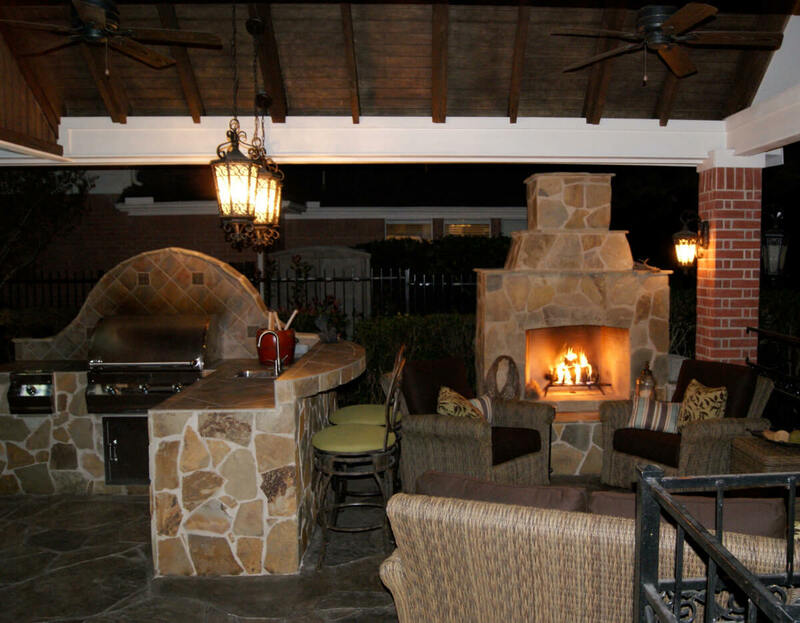 The beautiful wood-burning fireplace is finished in stone to match the outdoor kitchen. The fireplace can be enjoyed by everyone in this cozy space. The project makes great use of lighting and looks spectacular at night.